Microsoft Outlook is amongst the top email platform being used owing to the various options Microsoft has integrated in it. It is not only depended upon by users for communication purposes, but also for personal data management, which is why it is also popularly known as Personal Information Manager. However, the few limitations imposed on Outlook regarding the accessibility of its data file and export options, and more have put the client in limelight for its flaws as well. Nevertheless, Outlook still is counted amongst the best of email clients but at somehow requires external help to get few things done that it is not capable of doing on its own. For instance, Outlook contacts are easy to be shared with other applications/clients or even devices. This is because, the client supports exporting its contacts as vCard format files which is amongst the most versatile contact storing file types supported not only by a variety of applications are even devices like; smartphones, PDA’s, and more. Despite the procedure being extremely convenient, users trying to export Outlook contacts to vCard are confronted with trouble. You can very much convert Outlook contacts to vCard (VCF) files without any external help required. However, the only condition is that the export must be carried individually for each contact. Therefore, users end up having third party tools as the last resort. When referring third party applications, vCard Export plays an important role in the respective category. 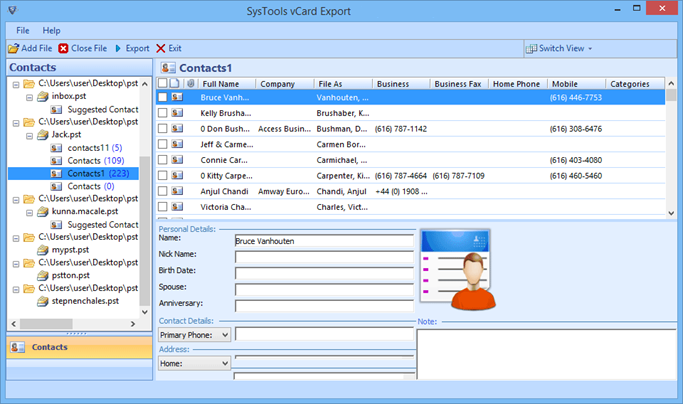 The application acts as a suitable platform for the export of bulk contacts from Outlook to vCard format file. General Users: Users working on Outlook for a long time with all contacts maintained within its address book. This set of users usually ask for such export because of the fact that vCard type files are easily available and once converted, the contact can further be shared easily with others, if required. Business Users: Businesses are all about contacts – making and sharing contacts. However, when it comes to sharing contacts, technical issues may stumble upon causing the user to go for an external solution. Working out the conversion with vCard Export is extremely convenient, especially when compared to manually extracting the contacts. 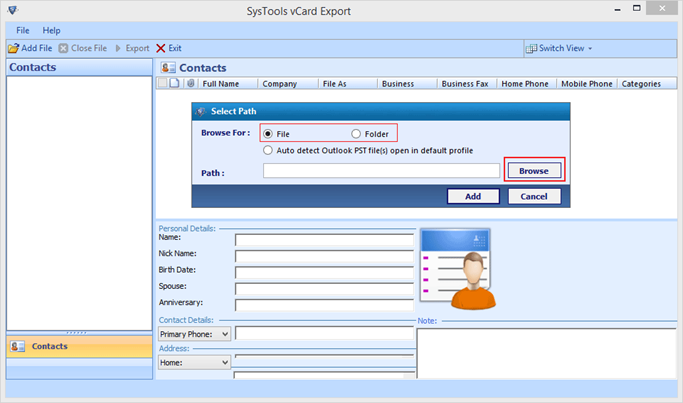 Given below are steps to be followed to export Outlook contacts to vCard. First select the file individually or in bulk (folder selection) from which contacts need to be extracted. Otherwise, the respective Outlook profile can itself be detected for contact conversion. Preview contacts found within the selected profile along with all the fields. Later, the contacts can be extracted as a combined vCard file or a vCard file for each contact respectively, as per the requirement. The output can then be saved at a location of the user’s choice. 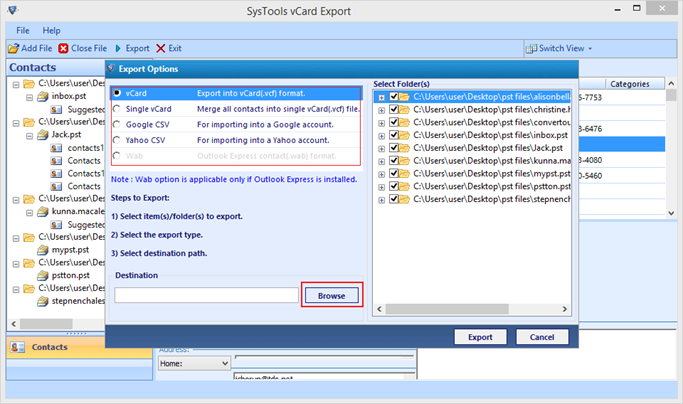 Conclusion: Besides export of contacts from Outlook to vCard format files, the application also features other options for contact export, i.e. Google/Yahoo CSV and Windows Address Book file. This adds up to the benefit of having the tool as the users are provided more than just one output formats, i.e. more than one platforms to get Outlook contacts transferred.